Mark Altaweel is surprised at how easy it is! A few hours into a hunt around London, the Near East specialist from the UCL Institute of Archaeology has uncovered objects that, he says, are “very likely to be coming from conflict regions” in Iraq and Syria. The items—pieces of early glass; a tiny statue; some fragments of bone inlay—range from the second to fourth centuries b.c. Altaweel says they are so distinctive that they could only have come from a particular part of the region: the part now controlled by the so-called Islamic State. That we were able to find such items openly sold in London “tells you the scale—we’re just seeing the tail end of it,” he says. Unesco has added its voice to a chorus of concern, warning that looting in Iraq and Syria is taking place on an “industrial” scale—one more sorry aspect to the devastating conflicts in the region. This Mesopotamian area, the cradle of civilisation, is a giant archaeological site—it’s where the first cities were built, and contains treasures from the Roman, Greek, Byzantine and Islamic periods. Today, the pillaging of cultural heritage sites shows up on satellite maps that are pock-marked with hundreds of recent, illegal excavations. Some media reports suggest this income stream is the “second-largest source of revenue” for the group (after oil sales), but in reality it’s impossible to tell. What’s certain is that, while Isis grimly documents its destruction of Unesco sites such as Nimrud, profiteering from plundered antiquities has helped make it the most cash-rich terror group in the world. London, one of the world’s largest antiquities markets, is considered a natural destination for looted goods. For the purposes of our research around the city, Altaweel is posing as an antiquities collector. He wears it convincingly, but the pose is an uneasy one. Altaweel doesn’t much like antiquities collectors—or rather, the very concept of the trade itself: antiquities, he feels, “shouldn’t be bought and sold in private collections”. Altaweel’s interest in the region is personal as well as professional: he is an American who was born in Baghdad and has lived in Basra—we trade biographical information within minutes of first talking, as happens when you suspect someone’s surname is from the same region as yours. Altaweel is related to (and inspired by) the influential Iraqi archaeologist Fuad Safar, who led some of the country’s early excavations and is still widely cited within the profession today. Although his family left Iraq in the 1980s, when he was seven, Altaweel frequently returned to visit relatives. He has worked in most of the countries that fall within the near east region—from Egypt to Iran, from Turkey down to Yemen and southern Arabia—including numerous digs in both Iraq and Syria. During our scout for looted treasures, he occasionally notes that he has in the past “dug up” objects exactly like the ones we spot. After a few tip-offs, an online search and a couple of dead ends, we uncover some small antiquities at dealers in central London. It takes a lot of scouring through a lot of objects, but Altaweel is fast. His eyes fly over row upon row of items—glass, coins, pottery, small statues, lamps, cylinder seals—and when he lands on an object of interest he lights up: despite the purpose of our search, it is obviously exciting to find and examine these antiquities. (“Do I need to wear gloves?” he asks the first dealer. He doesn’t; the market, unlike the field of archaeology, really isn’t bothered.) Altaweel’s discussions with sellers brings his expertise to the fore, as he politely adjusts their assessments of their own wares. “This is all Indian,” one trader says. “I think it’s probably near-eastern,” Altaweel quietly corrects. “These items are from the Islamic period,” another offers. “Unlikely,” Altaweel states. It’s like watching a rapid-fire game show premised on calling out archaeological bluff. Every time Altaweel zones in on something that seems likely to be from an area now controlled by Isis, the dealer we’re talking to grows vague about the item’s origin. One seller says that some objects, almost certainly Syrian and from the area that Isis declared as its caliphate, were brought in a few months ago, by a private seller who said the goods had come from a family collection. Another suggests that a small statue—for which Altaweel says every type site is either in Iraq or Syria—was bought at an auction. There is never any paperwork. One dealer, an amiable man in a quiet, small store filled with near-eastern objects, told us that he’d acquired some glass fragments very recently, and that they had likely come out of Jordan. Later, Altaweel tells me: “It’s obviously not Jordanian, so my suspicion is that it’s coming out of Syria.” The piece he shows us—a fragment of a cup or glass container, selling for £250 ($A528)—is, he adds, highly distinctive of the area. “It’s very early glass and is concentrated in very few areas,” he says. Sam Hardy, an expert in conflict antiquities, says such scenarios are typical. A common practice is to fudge provenance by claiming an antiquity has been in the family for a long time—and so could not have recently been smuggled. Perhaps the person who approached the dealer with a stash of antiquities asked to remain anonymous. Or maybe the items were, until recently, sitting in a private collection in Jordan or Lebanon. How could you prove that any of these treasures were smuggled out during the current conflict? “The industry runs on trust,” says Hardy. “By not keeping any records, dealers make it easier for buyers to convince themselves there is no evidence of any wrongdoing.” That, in turn, makes it harder to enforce laws relating to the trade in stolen antiquities. According to Syrian archaeologist Amr al-Azm of Shawnee State university in Ohio, when Isis took over swathes of the region, it also took hold of the already existing practice of illegal excavation. Until 2014, looting was carried out by various armed groups, or individuals, or the Syrian regime. Using information gathered by local Syrian activists, Al-Azm found that Isis initially levied 20 percent taxes on those it “licensed” to excavate. In mid-2014, the group began to contract out excavation. But by autumn of that same year, Isis was “starting to hire their own archaeologists, digging teams and machinery—and that’s when we saw a peak of looting activity.” At that point, the trade was lucrative enough for Isis to invest in it. All this coincided with the US-led coalition’s bombing campaign against Isis targets, which curtailed other income streams such as oil, livestock and crops from seized areas. Isis began to enforce punishments for looting without a licence, says Al-Azm. The group started to control the dealers and middle men, getting savvy to the market, scouring the internet to see which artefacts would sell at a higher value. Trade in looted antiquities is not new. 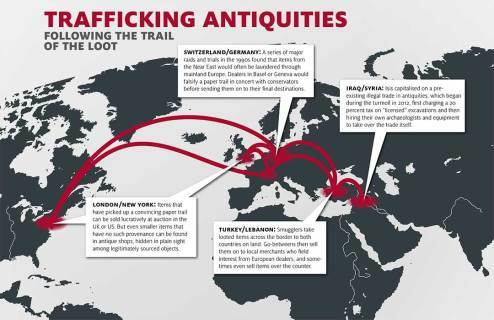 As a result of high-profile raids and trials during the mid-90s, investigators have documented the traditional routes for such objects. Objects from the near east would usually pass first through Turkey or Lebanon, before being moved into Switzerland, Germany or, less commonly, Italy. Christos Tsirogiannis, a forensic archaeologist working with the SCCJR, says: “Many antiquities dealers that we now know trafficked and traded in illicit objects were based in Geneva, Basel or Zurich . . . Germany was also picked as a country where, one way or another, the goals and aims of illegal traders were satisfied.” These European destinations, says Tsirogiannis, are where illicit goods were typically laundered—changing hands, passing between dealer and conservator in order to create a paper trail that would then be used to sell objects on to auction houses in London and New York. When the BBC covered the issue in February, they located a go-between in a town in southern Turkey, who gave a Skype interview in which he displayed artefacts that he claimed had been dug up months earlier in Isis-controlled Raqqa in eastern Syria. He told the BBC that the objects were destined for western Europe: “Turkish merchants sell it to dealers in Europe,” he said. “They call them, send pictures . . . people from Europe come to check the goods and take them away.” This same investigation also located a dealer in Beirut who said he had access to genuine Byzantine and Hellenic mosaics, which most likely would have been looted from Syria. This dealer, the Turkish go-between and the head of Lebanon’s bureau of international theft all told the BBC that Europe was the main market for looted antiquities from the region. Meanwhile, an undercover investigation by the Sunday Times in 2013 found archaeological treasures from the ancient Roman city of Palmyra (recently taken over by Isis) sold on the black market in Lebanon. But it’s impossible to know precisely what is being smuggled, to where—or how. It’s likely that looted goods are being sold online, or though established connections with private collectors. Sam Hardy, the conflict antiquities expert, says online sellers aren’t bothering to be secretive: “They’re using eBay to establish connections, or making sales using Skype, WhatsApp or Kik,” he says, referring to smartphone instant messaging services. On top of that, some experts in this field suggest, antiquities collectors can be patient: buyers with deep enough pockets can acquire stolen goods and sit on them for years, releasing them into the market when the heat has died down. But Christopher Marinello, director of Art Recovery International, says that, partly due to recent media attention, dealers now increasingly view objects from Syria as suspect: “Reputable dealers and auction houses are doing the right thing and asking the right questions”, when they come across antiquities with questionable provenance.